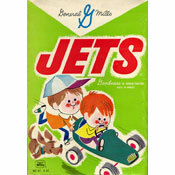 Select the cereal that was featured in the very first animated television commercial for a ready-to-eat breakfast cereal? This cereal has been described on the box as a "lightly sweetened whole grain wheat cereal" that is "naturally and artificially flavored." One box featured a smiling piece of the cereal writing "Excellent source of fiber" on the top of the package. Each piece is lightly frosted with a very flavorful cinnamon streusel coating. 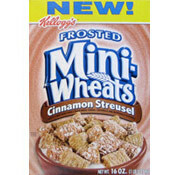 Frosted Mini-Wheats: Cinnamon Streusel Cereal has been reviewed on MrBreakfast.com. What do you think of Frosted Mini-Wheats: Cinnamon Streusel?